Few management measures exist for the conservation and protection of Sabellaria alveolata reefs. "Reefs" (code 1170) are listed under Annex I of the Habitats Directive 92/42/EEC on the conservation of natural habitats and of wild fauna and flora. As a result, via the Natura 2000 network, these biogenic reefs should be included in Special Areas of Conservation in which the aim is to prevent, by a series of legal measures, the deterioration of this natural habitat. In practice, despite this European framework, few member states have adopted legislation protecting S. alveolata reefs. In the United Kingdom, a Biodiversity Action Plan (UK BAP) was published back in 1994, as the UK Government’s response to the Convention on Biological Diversity (CBD). As part of the UK BAP S. alveolata reefs were mapped, referenced and are surveyed. Outside of the United Kingdom, a few regional or local measures have been taken in order to inform users and protect the honeycomb worm reefs. In France several municipalities have put up billboards raising environmental awareness of honeycomb worm reefs, as trampling damage and extraction of worms for angling bait by beach users poses a major threat. In the Mont Saint-Michel Bay, the largest European biogenic reef also happens to be a recreational shellfishing hotspot. During spring tides, thousands of people, either on foot or on tractors, frequent the bay, to harvest all sorts of marine organisms. During spring tides in the Mont-Saint-Michel Bay on the Sainte-Anne reef (in the background), dozens of tractors carry recreational beach harvesters to the honeycomb worm reefs (4km), where they collect mostly oysters, mussels and clams. 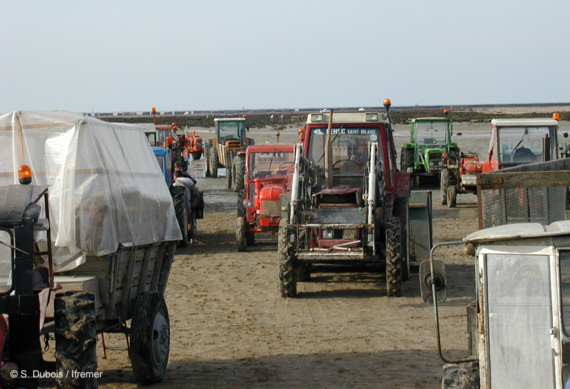 In France, several decrees limit the number of people per tractor or the amount of shellfish harvested per person, which indirectly protect the reef. A municipal decree specifically mentions that S. alveolata reefs in the Mont-Saint-Michel benefit from being listed as a "shellfish deposit which regulates beach harvesting and forbids all forms of reef deterioration and destruction" (article 7 of decree n°247 from the Rennes D.R.A.M.). The Saint Anne reef is however particularly threatened and currently in a poor state of health, which demonstrates that despite the existence of legislative measures, they are not applied. Educational measures would perhaps reinforce the awareness of the need for environmental protection of this unique threatened habitat. A reef mapping survey, carried out in the same manner as in the United Kingdom, is a necessary step in the assessement of the health status of Sabellaria alveoalata reefs in France, Atlantic Spain and Portugal.